Are Marble Floor Saddles and Thresholds the Same Thing? Yes they are. It’s just a name preference. Whether you call your distributor asking for a marble floor saddle or threshold won’t render you a different product. They are one in the same. One might ask: Why are there two different names for one product? Good question. How do things normally earn multiple names? Here again, it’s all about preference in how one perceives a certain item. No one really knows how this builder’s commodity earned two names. One can only speculate. While what’s in a name can have a lot to do with an item, here it’s not the case. A marble threshold or saddle is used for sealing two different types of flooring together. It doesn’t necessarily have to be different flooring material. It’s just that when you’re laying a certain types of flooring in a room, it usually ends at the doorway. In that doorway is a seam that can peel up, rip, tear, or fray and can be a potential danger for anyone walking through, causing that person to trip, fall, or even cut themselves. Thresholds are the perfect building material to seal floors, combining them together, and making them look like one cohesive floor unit. The art of it all is making it look natural. Just like a horse saddle is designed to fit perfectly between the horse and the rider, a threshold must also do the same. Thus, the term “floor saddle”. Except with the floor saddle, there are three sides to a marble threshold that must fit perfectly. The most important side is the bottom, which lays on the foundation. When you’re installing marble thresholds, you want it to have a seamless transition. That usually means embedding the marble threshold as close to the subflooring as possible. Marble thresholds have become the preferred builder’s choice because of it’s beauty, durability, and uniqueness. The type of marble saddle builders usually refer to is the Standard Double Bevel that measures anywhere from 2”, 4”, 4 ½”, 5”, 6” x 3/8”, ½”, 5/8” ¾” with a ¼” bevel to prevent any accidental injuries. This is basically a beautifully crafted brick of marble that wedges perfectly at the bottom of doorways. If it is installed correctly, it will have a seamless connection between flooring without any bumps that could make a floor look unleveled. In short, the marble threshold ‘saddles’ in between floorings. Since most types of flooring are sold in large diameters, installing it between doorways makes the process challenging. That’s why most builders prefer thresholds because it makes for an easier installation. Marble is organically made deep within the earth through a metamorphic process that melts and combines limestone, along with other minerals and fossils together through an immense amount of heat and pressure. These fossils and minerals may consist of a variety of colors. This in turn will create a spectrum of color variations that is also referred to as color veining. As these elements cool, they form a stronger bond, creating a new kind of mineral with swirls of different fossils and minerals coming together in a sealed, lustrous gloss. Depending where you mine marble, you can get a different color veining, and even when you slice a slab of marble from the same quarry, you may also get another pattern. In most cases, no two pieces will be the exact same, which gives marble it’s dimensional and unique beauty. If you’re looking for a threshold that won’t ever need replacing, then marble saddles are exactly the material you’ll want to use in place of metal or wood. With marble, you won’t have to worry about it wearing old, getting scraped and catching dirt in the groves like the metal thresholds often do. You won’t have to worry about bugs, or termites eating their way through your thresholds, as it would be with the wooden thresholds. Plus, neither of them look as good as marble. As a building contractor, you’re probably looking for building supplies that can be purchased in bulk. It may appear that you could be putting all of your eggs into one basket by risking your money in a bulk load of marble thresholds. It could also be argued that buyers have a preferred taste. There’s also the fear of contemplating what if you choose a type of marble that doesn’t appeal to your buyers? The answer is simple. Find a marble saddle distributor that offers a select inventory of the most sought after thresholds. This way, you’re less likely going to have an inventory of unwanted marble thresholds collecting dust in your warehouse. 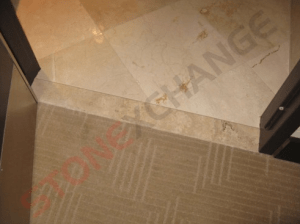 Stonexchange, a manufacturing wholesale marble saddle distributor located in South Florida stocks only the best selling marble thresholds in the industry. We also have travertine thresholds which is most preferred for outdoor features because of it’s textured surface. No matter which kind of marble saddle you purchase from Stonexchange, you’re sure to stock a brand that most buyers prefer. Our company also keeps an abundant supply of marble window sills and soap shelves. They are all offered in: Nuevo White Carrara, Crema Sahara Marfil, Black Granite, Pure White Thazoz, Bardiglio Gray, and Emperador Brown. To view Stonexchange’s online inventory of these building materials here. Place your order with Stonexchange today through our online form, or call us toll-free at 1-305-731-2400.